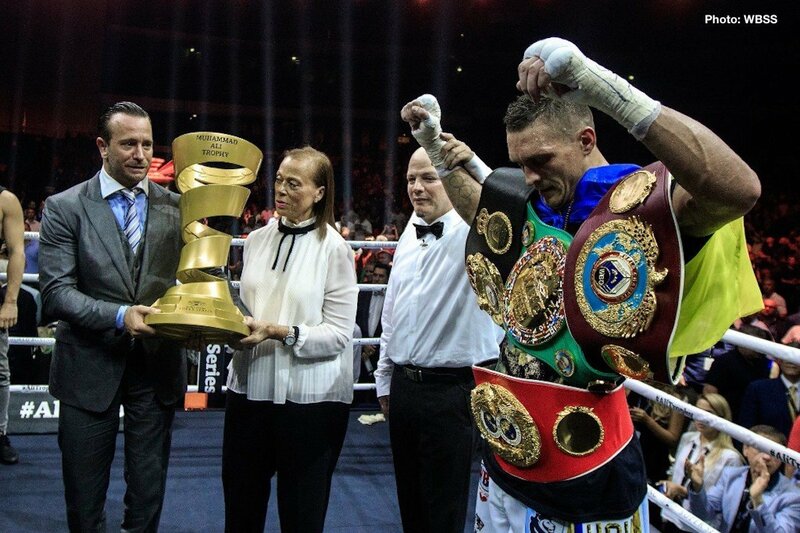 Oleksandr Usyk (15-0, 11 KOs) triumphed on Saturday night in beating a badly over-matched IBF/WBA cruiserweight champion Murat Gassiev (26-1, 19 KOs) by a 12 round unanimous decision to win the Muhammad Ali Trophy in capturing the World Boxing Super Series cruiserweight tournament at the Olimpiysky Sports Complex in Moscow, Russia. After the fight, Usyk challenged former World Boxing Council cruiserweight champion Tony Bellew to a fight. It’s unclear if the fight would take place at cruiserweight or heavyweight. Bellew fights at heavyweight now, but he said recently that he would be open to fighting the winner of the Usyk vs. Gassiev fight. That’s obviously a fight that would be a big deal in the UK, but it wouldn’t resonate in the United States. That doesn’t matter though, since the World Boxing Super Series tournament wasn’t televised in the U.S.
Gassiev needs to go back to the drawing board and figure out how to improve his game. The way that he fought tonight, he would have lost to Mairis Briedis had he been inside the ring with him. Gassiev took a lot of punishment in the fight, and you have to worry about where he goes from this. It might not be a good idea for Gassiev to take on a good opponent for a while because he needs to regain his confidence and figure out how to improve his game enough to keep his future opponents from using a high volume game plan to beat him. Usyk had Gassiev with just his jab alone tonight. You can bet that other fighters will be looking to do the same thing to Gassiev now that they’ve seen the blueprint in how to bet him. If Gassiev’s trainer Abel Sanchez doesn’t teach him how to defeat fighters that use jabs and a high volume punch output to beat him, he’s going to continue to lose. Usyk, 31, did a good job of defeating the 24-year-old Gassiev in front of his own Russian boxing fans in Moscow, Russia. The scores were 120-108, 119-109, and 119-109. The scores were fair. At best, Gassiev deserved to win one round of the fight. Gassiev simply didn’t do enough to be competitive in the match, as Usyk took him school and beat him in an embarrassing manner. The one-sided contest was such a mismatch that the fight was boring after the 4th round. Each round saw the same thing with Usyk throwing rapid fire machine gun combinations and frequent jabs. Usyk was landing almost everything he threw, but he didn’t possess the power to get Gassiev in serious trouble. Usyk appeared to stun Gassiev in the 10th round after hitting him with a left uppercut to the head. Earlier in the fight, Gassiev had stunned Usyk with a right to the head late in the 3rd. Usyk staggered back to his corner at the end of the round. Usyk likely would have survived the round anyway if he’d been hurt earlier in the round, because he was holding on after being hurt. Usyk would have been smart and made it through the round no matter what. Gassiev was moving forward the entire fight, but he was looking too much for a big shot instead of focusing on connecting. It wasn’t easy for Gassiev to land his shots when he was targeting Usyk’s head, because he was moving frequently and not presenting an easy target. Gassiev had better success when he would throw body shots. However, Usyk could look to the referee when Gassiev would hit him with belt line shots. He also did this frequently when Gassiev would accidentally bump heads with him. Usyk would look at the referee for help. Mairis Briedis (24-1, 18 KOs) beat a pudgy looking Brandon Deslaurier (11-2-1, 10 KOs) by a one-sided 10 round unanimous decision. Deslaurier was in the survival mode from the 1st round just covering up and looking to go the 10 rounds without trying to win. Briedis tried his best to score a knockout, but Deslaurier did a good job of covering up to block the incoming. In Briedis’ previous fight, he lost a 12 round majority decision to Oleksandr Usyk in a unification fight on January 27 in the semifinals of the World Boxing Super Series tournament in Riga, Latvia. Briedis did a far better job against Usyk than Gassiev did tonight. Based on how Briedis looked, you have to conclude that he’s now the second best fighter in the cruiserweight division behind Usyk. Unbeaten WBA, WBC, IBF, WBO female welterweight champion Cecelia Breakus (34-0, 9 KOs) beat the game but over-matched Inna Sagaydakovskaya (7-1, 3 KOs) by a one-sided 10 round unanimous decision. The judges scored the fight 98-92, 98-92, and 97-93. Former World Boxing Association super middleweight championFedor Chudinov (18-2, 12 KOs) won a controversial 12 round split decision over former world title challenger Nadjib Mohammedi (40-6, 23 KOs). The judges score the fight 115-113, 116-112 for Chudinov, and 118-111 for Mohammedi. Boxing 247 scored it for Mohamedi by 116-112.